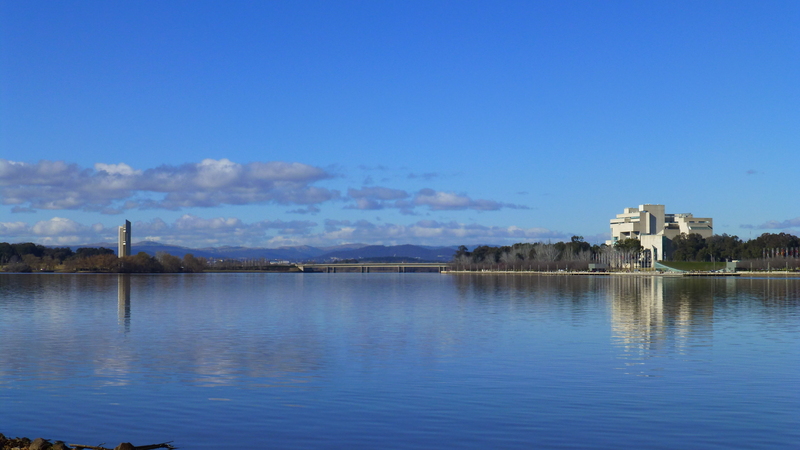 Lake Burley Griffin is at the heart of Canberra, the Capital City of Australia. There are two bridges that cross the lake and form the sides of the Parliamentary Triangle. At the apex of the triangle is Parliament House. Below it, the white building is Old Parliament House, now used as the Museum of Democracy. 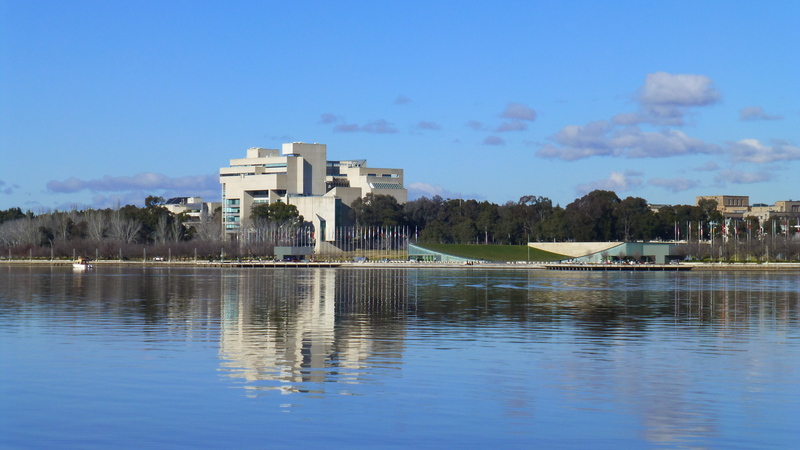 The National Art Gallery and Portrait Gallery, the High Court, Questacon – the National Science and Technology Centre – and the National Library are all set in the park that stretches along the lake’s central basin between Kings Bridge on the left and Commonwealth Bridge on the right. The red avenue in the centre of the diorama is ANZAC Parade and that leads to the War Memorial. To the left of Kings Bridge is the lake’s eastern basin. Bowen Park, where we walked in a previous journal, is at the top of this part of the diorama. We live just a couple of suburbs away. The Carillon is set on it’s own small island just to the right of the bridge. Back to the main diorama. 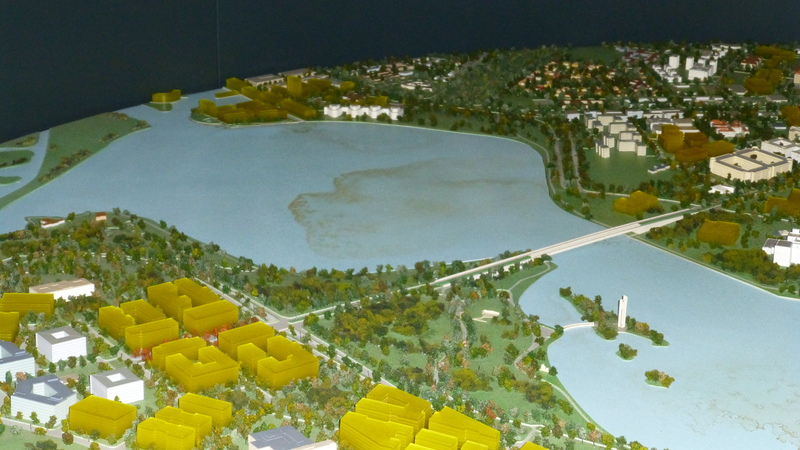 Top right, above the Commonwealth Bridge, is the western basin of the lake. The building far right is the National Museum of Australia. The walking bridge does not exist yet – it’s in the planning stages. Centre right is Commonwealth Park and the smaller lake, Nerang Pool, is where we’ll visit in our next journal entry. 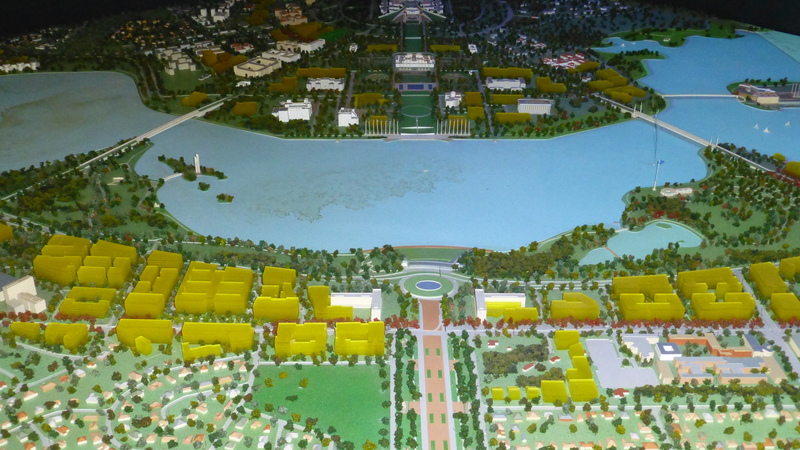 This diorama is housed in the Regatta Point Building, the white building in Commonwealth Park. It’s set on a hill, a great vantage point from which to view the other side of the lake. Now let’s look at some photos I took yesterday from Regatta Point. The National Library of Australia is perhaps my favourite building in Canberra. The fiery autumn leaf photos in an earlier journal were of the trees, now bereft of their leaves, on the lakeside walk by the library. The flag pole on top of Parliament House is to the left of the library. Questacon National Science and Technology Centre is on the left. Further along that lakeside walk, passed the flags of all the nations that have diplomatic ties with Australia, is the High Court. Tucked in behind that is the National Art Gallery of Australia and the National Portrait gallery. I do enjoy walking by the lake in that area. In this photo, the High Court of Australia is on the right and the Carillon is on the left. The bridge is Kings Bridge, one of the two traffic bridges that cross the lake. 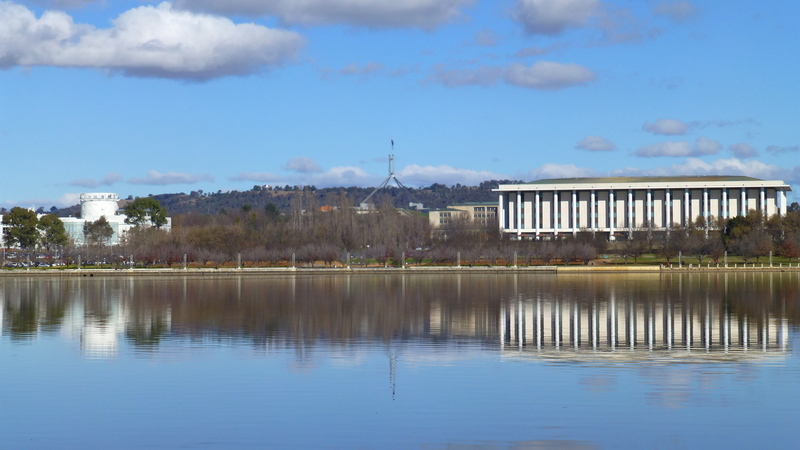 Canberra is well known as a divided city – with suburbs and satellite city centres to the south of the lake and those to the north each engendering great loyalties. We are southies! Turning into Commonwealth Park from the main lake there’s a short walk to the smaller lake known as Nerang Pool. 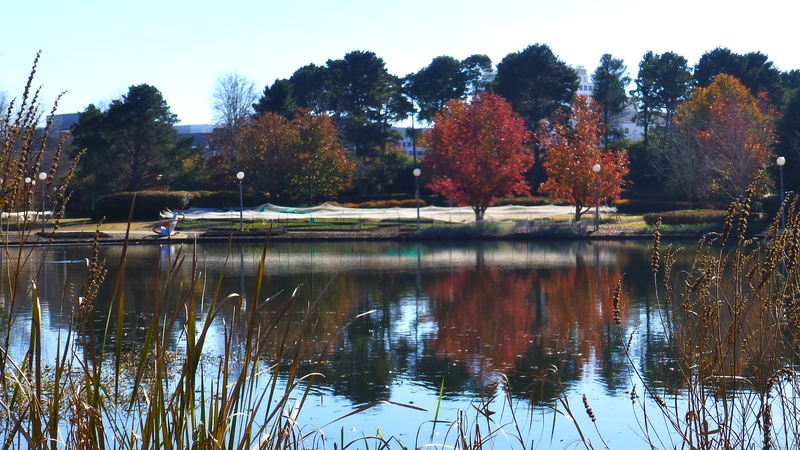 It’s a haven for water birds close the main civic centre of Canberra which is just beyond those trees. This area around Nerang Pool is the site for Canberra’s spring flower festival, Floriade. The garden beds for the 2012 show have already been prepared and planted and are currently protected by mesh. Floriade begins in mid September and goes until mid October. Just now, in the colder months, it is quiet here and in the next JT’s Jottings we’ll take a walk around this small lake.